Nonstick cooking spray or 1 teaspoon unsalted butter, to grease the pan. In a medium saucepan over medium low heat, melt the chocolate with the butter and saffron, stirring occasionally. Set aside. In a large bowl, whisk together the eggs and both sugars. Stir in the melted chocolate, butter and saffron. Stir in the vanilla. In a separate bowl, combined the flour, baking soda, and cinnamon. Stir the flour mixture into the chocolate mixture until well combined. Grease a 13 x 9 inch pan with non-stick cooking spray or the tablespoon of butter. Pour the batter into the pan and bake for 30 to 40 minutes, until toothpick comes out clean. Let the brownies cool to room temperature before cutting into 4-inch square. For best results; brownies should be mixed by hand. Over-mixing the ingredients can cause brownies to turn out tough or a thin crust may form on top. Mix wet and dry ingredients just long enough to blend them. Do not over-mix after the eggs have been added. Spread the batter evenly for uniform baking, thickness and texture. Reduce the baking temperature by 25°F if using dark or nonstick baking pan. Fully baked brownies will shrink away from the pan slightly. To test for doneness, insert a toothpick halfway between the edge and center. If it comes out clean, the brownies are done. The center should be set (slightly sticky) but not dry. If the toothpick comes out completely clean from the center of the brownie, they are over-baked. 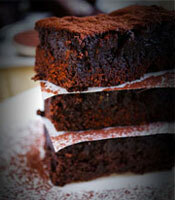 Allow brownies to cool completely in pan before cutting to prevent crumbling and to make cutting easier. Dip a sharp knife in hot water, wipe it dry, and move it across the brownies in an up-and-down sawing motion. Keep brownies fresh by cutting only the amount you need and covering the rest with plastic and/or aluminum foil.